Hello friends, I hope you all are doing great. Today, I am going to share Circuit Designing of LCD with Arduino in Proteus ISIS. In my previous tutorial, I have posted a tutorial on How to use Arduino Library in Proteus. Using that library, we can easily test Arduino code in Proteus to check whether its working or not. If you haven’t read that post then before starting it, first read it, as without adding the arduino library we can’t use Arduino in Proteus. First of all, design a circuit of LCD and Arduino in Proteus ISIS, if you have already added the Arduino Library then you won’t find any problem in finding the Arduino in components library of Proteus. You should also download this New LCD Library for Proteus. Now, we need to design Arduino sketch for LCD, so open Arduino software and place below code into it. You should have a look at How to get Hex File from Arduino. For Arduino code, I have used Liquid Crystal Arduino Library, which you can download from the below link and add it in the libraries folder of Arduino software. 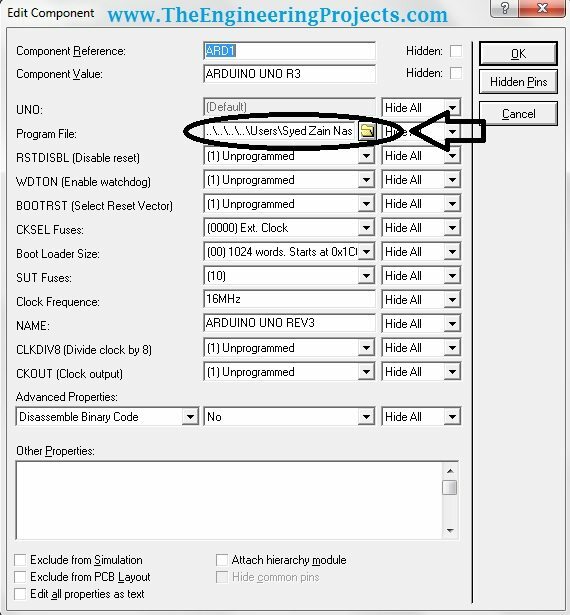 Now compile the code, and get the Arduino hex file which will be in the tmp folder, you can read Arduino Library for Proteus to know in detail how to get the hex file of Arduino sketch. Now double click the Arduino in Proteus ISIS and properties window will pop up. In properties panel, under the Program File section, browse to Arduino hex file as shown in below figure and upload it. That’s all, was it difficult ??? I dont think so 🙂 Anyways, if you got into any trouble, do ask in comments. In the coming posts, we will explore Arduino in Proteus ISIS more. Till then take care !!! Is it possible to simulate Arduino DUE in proteus? Which pins of the lcd are grounded?4,5,6 or only 5? Only pin # 5 is grounded. im receiving Errors when compiling your code above , any suggestions? Would this cause an issue when i upload he Hex code in Proteus ? The error comes is because of ” this sign so simply remove this sign and add it again your code and it will start working. Can you explain on how to debug this code on Proteus? That’s something I really wanna learn. Thank you. We can’t debug code on Proteus, we just upload the hex file in proteus. Although, we can debug the code in almost all compilers. hello i just uploaded your code but data from digital pins is not going to lcd..and so that it shows blank lcd ..can u suggest me what to do????
. Where can I find this display of the VSM model? In this library it is? I work with the display in parallel mode. Is that possible? Or not? I need to look sophisticated multi-level menu options, and graphics. I really important is your answer. Yeah it can be done quite easily, add me on Skype and let me know the details. My Skype id is “theenggprojects”. there is no error while compiling,the LCD turns on,the led’s showing the same way but the letters on the lcd are not showing up,i see a blank lcd in light green colour,please can u help me? First thank you for all your great works. I wonder if you have the library for Arduino GY-521 MPU-6050 Module 3 Axial Gyroscope Accelerometer Stance Tilt, by any chance. what is invalid opcode 0x9419 at pc=0x095A mean? hye.. i gkt this problem which make me complete blunt on my project.. i have seen many connection for lcd, i make connection gnd(1,5) vdd and vee loop (2,3) pin lcd 4 to arduino 12 and pin lcd 5 to arduino 11 for D4(11),D5(12),D6(13),D7(14) at arduino 5,4,3,2 .. please help me is this right or wrong or contact me at adamizrul@gmail.com..
You can download working simulation from this tutorial. Click on the button above to download. Could you make teaching how to build a component with PROTEUS VSM SDK ? I run the simulation and I got “Invalid opcode 0x9419 at PC=0x0A94”. Have you added the hex files of Arduino and LCD ?